The Auckland Regional Council (ARC) is holding a public open day to discuss ideas and options for the development of design guidelines for ARC parkland at Piha. The ARC recognises that Piha is a place where people can enjoy a natural setting that is relatively ‘untouched’, offers informal recreation in a large natural setting and respite from the stresses of everyday life. 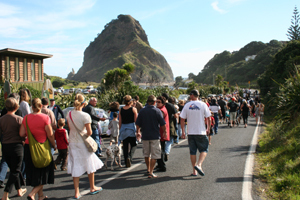 The aim of the Piha Design Guidelines will be to ensure that these qualities are conserved and enhanced while continuing to provide for the well-being of visitors and residents. Identifying design criteria for Piha park assets such as seating, signage, tracks and buildings will become part of the work over the next six months – They will offer ‘one stop shop’ best practice guidance for park staff and anyone who does work on the park. The proposed study area includes land managed by the ARC from Anawhata to Te Ahu Ahu Road and encompassing Te Waha Point, North Piha, Whites Track, Maungaroa Ridge Track, Lion Rock, Glen Esk Road and Stedfast Park, Piha Valley Track, Home Track, Tasman Lookout Track, Kitekite Falls Track and Winstone Track. The final document will be presented to the Piha R&R in April and to the ARC Parks and Heritage Committee for endorsement in May 2010. To check out the Muriwai Design Guidelines go to www.arc.govt.nz (keywords: Muriwai Design Guidelines).